It wasn't until I moved to Rome that I learned something very, very important: The sign of a fresh (read: good) cannolo is that the tube is only filled with that delicious, just-cloying enough ricotta mixture when you order it. Not before. That's just one of many things that Ciuri Ciuri, the Rome-based Sicilian pastry shop, does right. 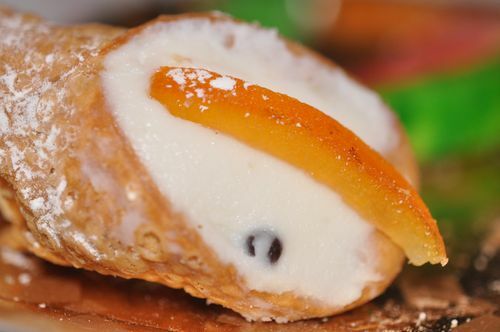 You may have had cannoli before, but — unless you've been to Sicily — you probably haven't had cannoli like these. I once met a Sicilian girl living here who swore that Ciuri Ciuri's cannoli were the only ones she would touch between flights home. And, as a confession, I usually find Italian sweets not-quite-sweet-enough. (Hey, I'm American: More is better, baby). That's never a problem with Ciuri Ciuri. (That, combined with the fact that one of their stores is right across the street from me, makes this shop very dangerous indeed). But no need to stop at a cannolo (with orange slice, pistachios, or chocolate chips, as you prefer). How about something Sicilian and savory, like an arancino? 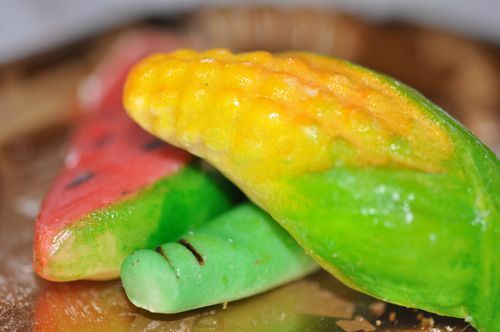 Or something that looks savory but isn't… like this marzipan? (I swear the corn cob tasted like corn. No, I wasn't sure how I felt about that). Ciuri Ciuri isn't Rome's cheapest pastry shop. A cannolo is (if I recall) €2.50, and those three chunks of marzipan above set me back some €8. But when it comes to tasting a little slice of heaven, who's counting coins? Ciuri Ciuri has four Rome locations: Monti (Via Leonina 18/20), Celio (Via Labicana 126/128), Largo Argentina (Largo Teatro Valle 1/2), and Trastevere (Piazza San Cosimato 49b). (Click the link for maps). And, by Rome standards, they're open strangely late — till midnight at all locations but Celio, where they're open till 11pm. What do you think of Bar Mizzica? I think I might have to give the nod to them of Ciuri Ciuri for Cannoli, as well as Granita. Hi Kenny, yes — Bar Mizzica is great, too! A bit more out of the way for most than Ciuri Ciuri, but also well worth a stop. Thanks for the reminder… I’m going to have to pay them another visit soon!